Compatible with all generation Apple® tablets ; iPad 1, 2 , 3, and 4. Tamper-resistant with a strong security cable Kensington lock and set of keys included. Lightweight, low-profile and portable desktop stand perfect for use in any environment. Features 360 degrees of movement and 180 degrees of tilt for easy visibility from all angles. Plastic construction is black for a professional style. This locking iPad stand is designed to fit all three generations of the Apple® tablet. This desktop secure kiosk is compatible with iPad 1, 2, 3 & 4. This desktop display, locking iPad stand is the most versatile desktop holding device for the Apple® tablet. A countertop display offers ultimate accessibility and style. This locking iPad stand that is for countertop use has easy access to all electronic ports, the home button, switches at the side and vents for sound to travel freely from the speaker. A secure desktop kiosk like the one seen here allows infinite adjustment and discrete tilt angles. This countertop tablet holder, locking iPad stand rotates a full 360° viewing in landscape or portrait mode. The plate can also be tilted 180° without having to move the tablet. 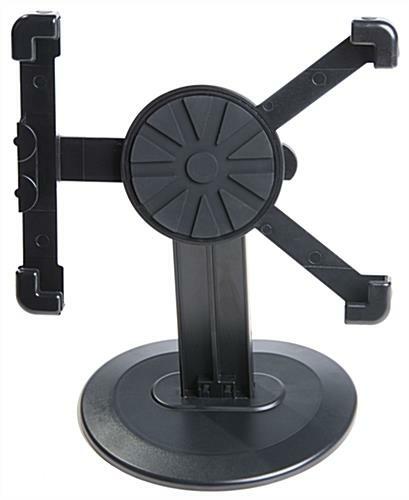 This desktop locking iPad stand that rotates can be adjusted easily anytime and anywhere for the best ergonomic viewing! The hands-free countertop display enables users to demonstrate their presentation in any position without having to hold the device on the hand. This locking iPad stand, also known as tablet accessory is portable but very stable. Just rotate the plate around to get the view that you want! One of the best features about this locking iPad stand is the case can be locked to a rigid object to provide everyday protection! 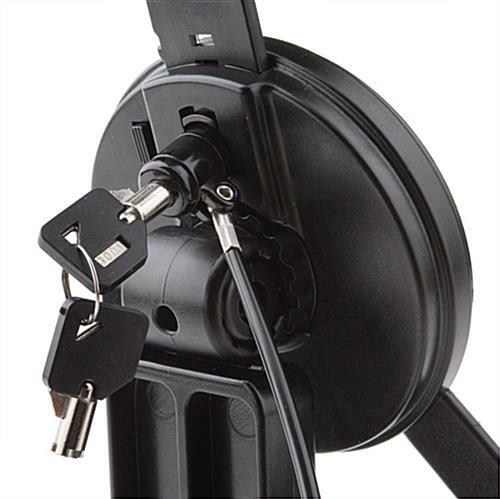 Each unit is sold with a strong steel cable and a set of keys included. 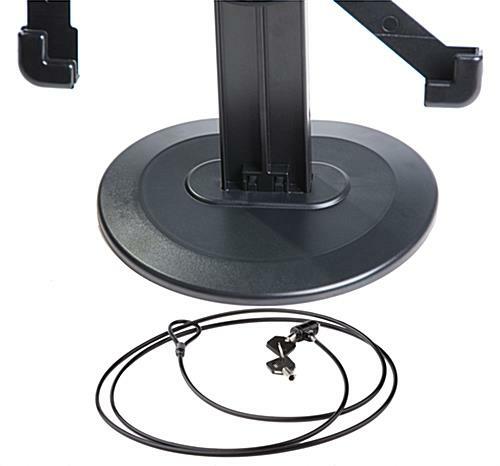 This wholesale locking iPad stand that is lockable features tethered lock and prevents from quick thefts. Since all the iPads in the market do not have the security slot, this locking iPad stand is an ideal way to keep the tablet safe. 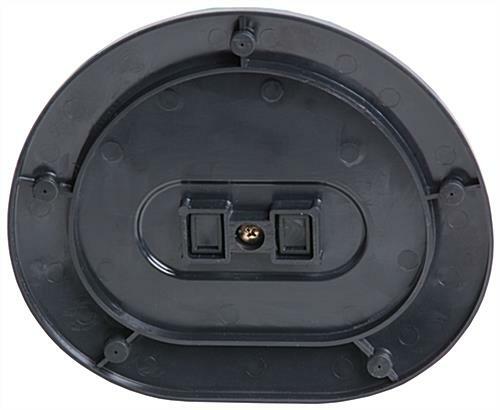 Trade show goers or businesses can lock the cable to the case and loop the other end cable's around a fixed object. Once the security case and steel cable are locked together, thieves will not be able to remove the tablet from the unit. This lockable counter holder weighs only 1 lb. making the unit a desirable tool for use in any off-locations especially in any showrooms, trade shows, hotel lobbies, service desks, retail stores or point of purchase environments. 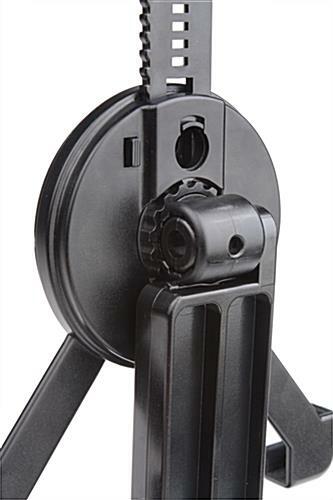 This product is made from nylon 66 materials that is lightweight. The unit also features cushioned corners and backer to protect the tablet from scratches. A silicone pad is also provided to keep the unit in place when used on the table. This countertop tablet holder will ship to customers unassembled. The slim, low profile and portable security case packs easily in the bag and can be set up in any location. The entire unit can be easily set up in just minutes! This countertop tablet holder has everything users need for displaying the Apple® tablet safely and securely. Purchase this tabletop accessory at a low price from this online super store! Click here to view the Assembly Instructions! Click here to print the IP198LOCBK Assembly Instructions. 7.9" x 14.0" x 5.0"
iPad 1st Gen., iPad 2nd Gen., iPad 3rd Gen., iPad 4th Gen.